Continuing my look at the year 1991 in music, I’ll now count down my personal top ten albums of that year. At #10 is U2’s Achtung Baby, the band’s seventh studio album and the first proper follow-up (setting aside the soundtrack album Rattle and Hum) to 1987’s classic The Joshua Tree. 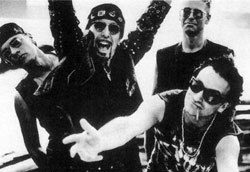 Achtung Baby was a massive hit, with 18 million copies sold worldwide, second only to The Joshua Tree among their discography. My recent countdown of favorite 90s bands might have given the impression that the decade really and truly sucked. And while I do think the 90s pale in comparison to, say, the 60s and 80s in terms of signature sound, some of my favorite work was produced during the decade. To prove the point, over the next several weeks I will count down my 20 favorite albums released in the 90s. One of these days I might get around to a theme week on U2. I feel about U2 the way I feel about Bruce Springsteen… appreciative of their status as legends, and a big fan of much of their work, but not a big enough fan to number them among my favorites. It seems to me that U2 fans (and Bruce Springsteen fans) are generally crazy about them the way I’m crazy about Elvis Costello. I find it hard to believe there are many casual Elvis Costello fans, but I’m sure they exist. And I’m living proof that casual U2 fans exist.